Wall beds are the ultimate space saving device that folds down from the wall to quickly and easily supply you with a primary or backup bed. Wall beds have been around for over a hundred years and while their popularity waned significantly during the middle of the 20th century, they have recently been rediscovered. Today, they are prized for allowing you to keep as much of your expensive floor space in play as possible. Saving Space – As mentioned, the humble wall bed is a champion when it comes to freeing up valuable floor space. Even more so than a sofa bed, the wall bed gives you back the square footage you paid so dearly for. Plus, unlike sofa beds, you’re likely to get a good night’s sleep. Saving Money – No need to put friends and family up in hotels when they come to visit. Just drop the wall bed down (make sure to watch the reaction) and you’re good to go. 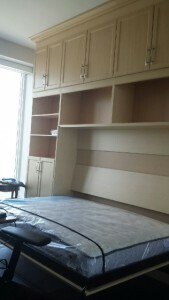 In many instances, installing a wall bed is actually cheaper than buying a regular bed as well. Flexibility – Wall beds can be mounted to the wall or floor in either a horizontal or vertical position, depending on the requirements of the space. They can be designed to emerge from behind sliding panel or swinging doors and can be built in any size you wish; from king size to the narrowest single bed when space is at an absolute premium. Multi-Tasking – The panels a wall bed hides behind when not in use can be made to mimic the exact look of the walls around them, have shelves attached that give them the appearance of a bookcase (which then fold under when the bed is opened) or they can be mirrored to make a tight space seem larger. Superior Closets has been serving the interior design needs of homeowners in the GTA for more than 2 decades. Our designers and fabricators are among the best in the business and, since we’re a family owned and operated business, you’ll get true, personalized customer service. Call us on 905-669-8280 to learn more about the old modern wonders that are wall beds.